Pharma is changing. 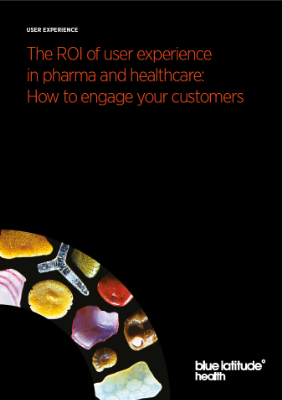 A 2014 eyeforpharma survey showed 86% of pharma executives felt that a focus on patient-centricity was the best approach for future profitability. But change is never easy. Within the pharma and healthcare industry, the introduction of a user-centred approach that incorporates best practice user experience research and design is rare. Often the world of user experience (UX), its activities, methods, and deliverables are not well understood within this industry. This situation contributes to the difficulty organisations have in becoming truly patient centric. This lack of understanding of how UX contributes to value, and therefore how it can be measured, means that organisations implementing a user-centred approach get stuck. They want to be more patient and customer centric, but don’t understand where their investment in user research and user-centered design is delivering a return. In this article, Head of Customer Experience Elisa del Galdo breaks down how to understand the return on investment of user experience. User experience methodology is a collaborative and iterative process that facilitates innovation for the purpose of solving a problem. It brings together multidisciplinary teams to achieve the best solution for all stakeholders – not just the business or exclusively the customer. The collection of data gathered from all stakeholders informs design and supports decision making when creating a solution. This ensures that critical decisions are not opinion-based, which can lead to the creation of solution that addresses perceived problems, not the ones your customers or your organisation are attempting to solve. The impact of user experience and its contribution to return on investment is well-documented. UX provides the insights via qualitative research that uncovers patient and customer requirements, and identifies the motivations, drivers, triggers, barriers, pain points, and context that drive behaviour. Not only does the practice of user experience deliver return on investment by producing a solution that solves a problem via technically deliverable design, it also incorporates the needs of the business. A user-centred process is driven by methodology that supports the effective and efficient creation of successful solutions.